Amid the prosecution’s widening probe into Oxy Reckitt Benckiser Korea and other companies related to their toxic humidifier disinfectants, the British firm apologized on Thursday to victims and unveiled a plan to offer an additional 5 billion won ($4.4 million) in humanitarian assistance. In a letter released Thursday afternoon, the company addressed its “social responsibility” in deaths and diseases caused by its humidifier sterilizers, saying it would cooperate with investigators to solve the issue as soon as possible. “Oxy RB Korea would like to express our sincere apology to those suffering and their families for the disappointment and anxiety due to the lack of a more timely communication related to the HS issue,” the company said in the letter. So far, the humidifier disinfectants have been blamed for claiming 228 lives in Korea for a harmful substance they contained that caused serious lung disease, with 70 percent of those having used the company’s products. The total number of injured victims reaches 1,528. The statement comes three days after local supermarkets Lotte Mart and Homeplus offered an apology for their involvement in distributing the harmful disinfectants here. It is Oxy’s first press statement on the issue released in the five years since the case was first brought to light. The Korean government confirmed in 2011 that it had found a significant association between the disease and the use of humidifier disinfectant. Earlier in the day, an official, who was in charge of customer service for the British firm, appeared at the prosecutors’ office for questioning. Prosecutors reportedly asked the official why some posts to the company’s website left by customers complaining about the products’ side effects were removed. The prosecutors and a team of 20 experts in medicine and pharmacy science have also reportedly confirmed the correlation, which they said will be presented as evidence in the upcoming trials. They are also studying whether the disinfectants could have caused damage to other organs aside from lungs. The prosecution suspects Reckitt Benckiser of bribing a professor at Hoseo University to fabricate research papers in favor of the company. The firm has cited the papers to claim that its products had not resulted in the deaths of pregnant women and infants. The prosecution expanded the probe into whether the British headquarters had approved the sales of the toxic products here. The British company has denied its involvement, saying it had been entirely the Korean subsidiary’s decision. While the firm has maintained that it had not been aware of its products’ toxicity, the company allegedly contacted a number of victims to offer compensation in return for them not filing a lawsuit as the investigation picked up pace. Prosecutors also said Thursday that during questioning last November they secured testimonies from company officials involved in research that they were aware of the harmfulness of the substance, but that they skipped safety tests. According to prosecutors, Reckitt Benckiser also allegedly deleted a number of materials and safety data sheets about PHMG, which is responsible for severe illnesses and deaths, from its computers. Prosecutors plan to summon researchers and executives at the company involved in manufacturing the products next week. Meanwhile, victims of toxic humidifier sterilizer plan to file a class action lawsuit against the products’ manufacturers and distributors to seek compensation, an environmental group said. The Asian Citizen’s Center for Environment and Health said that it will hold a meeting with the victims and their families on Sunday to form a group of litigants and discuss their plans for the lawsuit. 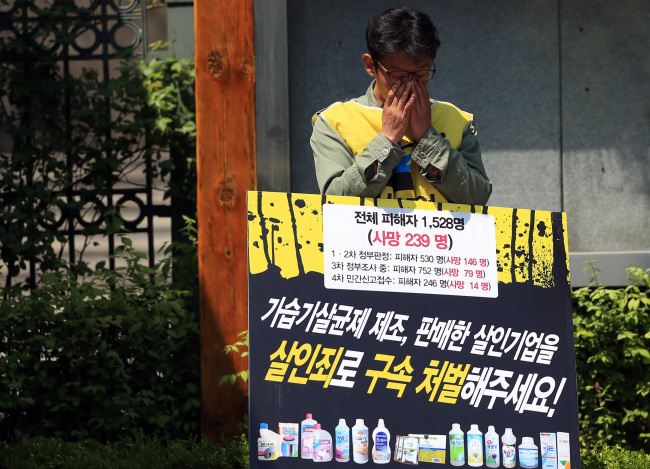 The victims are targeting Reckitt Benckiser and local distributors, including Lotte Mart and Home Plus, involved in manufacturing and selling the humidifier disinfectants in Korea. The Environment Ministry decided to classify the victims into four groups in accordance with the level of correlation between their disease and the use of disinfectant. It is set to compensate 200 of the victims who fell into the first two groups highly affected by the products. The center will raise funds to help the victims and their families as a whole rather than compensating individuals, he said. It plans to build a private research center and file a compensation suit in a British Court against Reckitt Benckiser.